Welcome to The Great Hall of the Nevins Memorial Library, another shining jewel among the many that makes us all wonderfully proud to live in Methuen. Thank you all for being here today. I am honored by the opportunity that the citizens of Methuen have given me. I look forward to working with all of you to move our city forward. Today is the beginning of an important journey for all of us and I am excited by your encouragement and support. Thank you to Father Richard Burton for your presence and prayers, to Krista McLeod and the Trustees of the Nevins Memorial Library for this historic setting for today’s ceremony, to the police and firefighter’s color guards, and to Paul Webster Greene and the North Regional Theatre Workshop for their important contributions to this event. 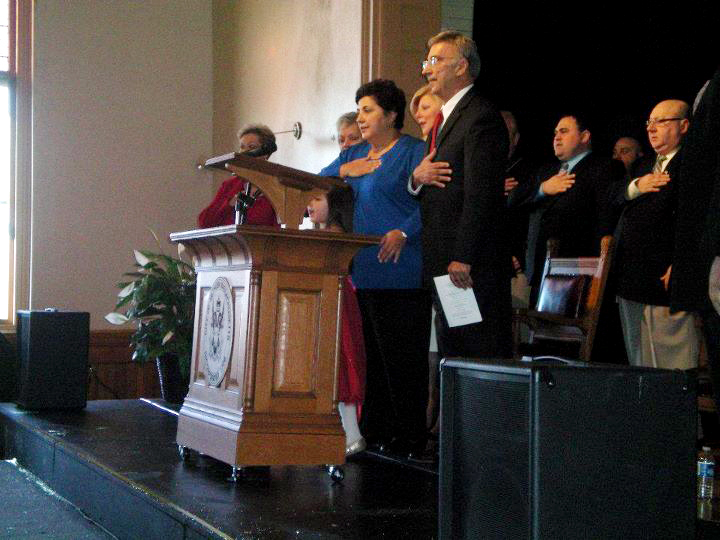 Finally, I’d like to thank our city clerk, Tina Touma-Conway, for presiding over today’s ceremonies. I am grateful, as we all should be, for the tireless service and commitment offered by our former mayors. Mayor Dennis DiZoglio, Mayor Sharon Pollard, and Mayor Bill Manzi – I simply say thank you from a grateful community. I must most importantly congratulate the members of the Methuen City Council. I look forward to working with each of you individually and collectively for the betterment of our community. As someone who has served on the City Council, I deeply respect the important role that each of you plays on behalf of our citizens. While we will likely disagree from time to time, I hope we will never lose sight of the common goals for our city. We should all strive to serve with pride, honor and respect for one another and our citizens. On a more personal note, I’d like to thank my beautiful wife Janice for her infinite patience and especially her sense of humor which I have severely tested over these past months. I’d also like to thank my son, Jeff and his wife Sarah; my daughter, Jana and her husband Vinny; my sister Florence and her husband, Jay. And, of course my grandchildren Gianna, Eva, Enzo, and my namesake Stephen. I’d also like to introduce the people that I’ve chosen to work with me in the Mayor’s office. Nancy Colbert Puff, who will serve as my chief of staff, is a highly skilled public administrator. She brings an outstanding education and extensive municipal experience to this important job. Joining Nancy will be Phil DeCologero, who has experience as a legislative assistant in the Massachusetts House of Representatives, and Juliette Cormier, a graduate of the College of the Holy Cross. This team represents a fresh start for the Mayor’s Office – we’re all anxious to get to work for the people of Methuen. I’m grateful for the opportunities that our city has provided to me and to my family. I want to work together – with all of you – to make available and expand these opportunities for future generations. If we make decisions and act with these future generations in mind at all times then, our discord will be minor and our mutual accomplishments plentiful. This will be the test of our success together. Like most cities across our country, we will continue to face many obstacles. As mayor, I will work with my partners on the city council and throughout the community to confront the challenges of our budget, to protect our citizens, to build our economy, and be a mayor you will be proud of. Maintaining a balanced budget always seems to be an uphill battle. We will work together to ensure an efficient and cost-effective government and look for opportunities to sustain services while saving taxpayer funds through consolidation, regionalization, and responsible privatization. Yes, saving money in the budget is important. But our ultimate success depends on generating new revenue as well. With the appointment of a skilled community development director who will work in concert with my staff, our government and community opinion leaders, we will better position our city to compete for new business opportunities…to expand our current workforce… and grow our tax-base. I am deeply committed to the success of Methuen businesses. I will appoint a Methuen Jobs Council to make sure that our business community has a seat at the table as we work together to create jobs and build opportunities throughout our city. As a career educator, I know that education equals opportunity. I’m looking forward to working with our School Superintendent, Judy Scannell, the members of the Methuen School Committee, and our teachers, administrators and other school staff to provide our children with the very best education while demanding standards of excellence by them and our students. Here again, we are not without challenges. I am deeply disappointed that our high school construction project – which is critically important to our children’s future – has already experienced serious setbacks. I will work diligently – and immediately – to put this project back on budget and on schedule. Let me turn for a moment to public safety and to the dedicated men and women that serve and protect our community. We have sadly been reminded of the sacrifices – the ultimate sacrifices – that these public servants are prepared to make to preserve the health and safety of our citizens. This administration will never compromise the safety of our citizens or the men and women who protect us. As you’ve heard me say before, I want to be a mayor that you are proud of. I am a man of my word and promise you that every day I am in office I will work hard to make this city as great as it can possibly be. We, all of us in this room, will work together to achieve this greatness – and be collectively proud of the manner and means in which we accomplish this vital goal. We are Methuen . WE ARE METHUEN. Thank you.